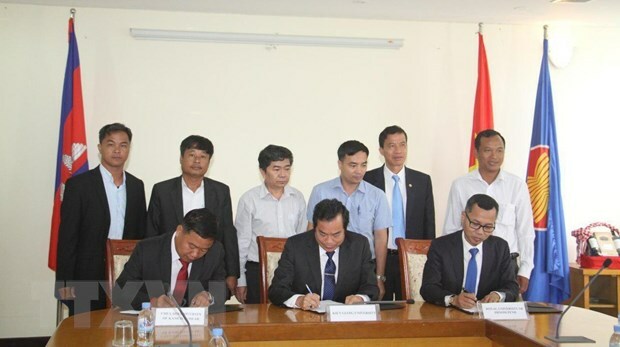 A university in the southern Vietnamese province of Kien Giang has inked an agreement with two Cambodian universities to enhance their existing partnership. The signing ceremony between Vietnam’s Kien Giang University and Phnom Penh Royal University and Chea Sim Kamchaymear University was held in Phnom Penh on Monday, according to the Vietnam News Agency. The three signed their first partnership agreement in 2018, which allowed 53 students from the two Cambodian universities to study at Kien Giang University for two years. During the event, representatives of the universities agreed that their partnership has enhanced research and education outputs for all sides. The parties reaffirmed their commitment to cooperate in academic research and education, as well as to expand their student exchange partnership. Under the new agreement, Kien Giang University is expected to admit and provide full scholarships for another 40 students from the two Cambodian universities in the upcoming 2019-20 academic year. Like their peers in the first batch of scholarship recipients, these students can follow one of the ten majors at the Vietnamese university, including agriculture, biology, and informatics. During their time in Kien Giang, the Cambodian students can also participate in cultural, recreational and sports activities to improve their Vietnamese language skills and better integrate into Vietnamese culture. Chet Chealy, rector of Phnom Penh Royal University, remarked that the partnership among the universities not only benefits students, teachers, and the institutions themselves, but also plays an important role in boosting the good bilateral relationship between Vietnam and Cambodia. Besides the scholarships, the three universities also agreed on enhancing scientific research and information exchange.